This month’s awesome cover art was designed for BN1 by local artist and illustrator, Manic Minotaur. Minotaur is no stranger to the Brighton art scene, you may have seen his psychedelic work on one of the Brighton snails last autumn! We caught up with Manic Minotaur to talk inspirations, aspirations and good vibrations. How would you describe your artistic style and what influences it? I tend to pack a lot of detail into my illustrations, but they’re lightening up a little bit recently. 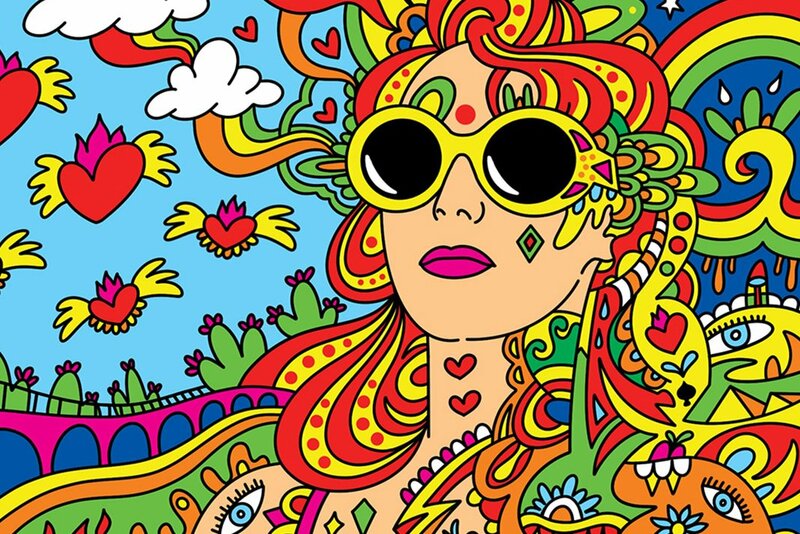 You could describe them as psychedelic, poppy, vibrant, very colourful. I like to create interesting imagery. Art where the viewer doesn’t spot everything in one sitting and sees something new each time. I think my work is influenced by life in general. I have a big interest in 60s music, the counter-culture, music bios and dystopian novels. 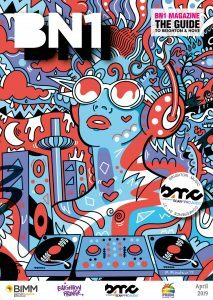 It seems almost serendipitous that I should be designing the front cover of BN1 Magazine for the Brighton Music Conference issue. As an artist, what’s been your proudest moment? I completed an intense foundation year at City College which enabled me to apply for university. Students were being urged away from using our first choice in applying for a position at University of Brighton because the illustration course has a strong reputation and is over subscribed. I was very proud to be accepted onto the course. Also, being one of the selected artists for 2018’s Snailspace project. I designed and painted my snail Persephone, she was auctioned and raised £4,800 for Martlets Hospice. I felt like a lot of hard work and determination had paid off since graduation. The Snailspace project took up a lot of time during the summer, painting with a bunch of great artists in a sweaty warehouse during the heatwave. I did lots of craft fairs and markets. I had work on display in Cafe Plenty, Big Beach Cafe, Dynamite Gallery and the Bluebell Would Artists Open House. Friend and local street artist Cassette Lord kindly shared his space with me at the Warren as part of the Fringe Festival. I’m currently painting a mural in the car park of My Hotel Brighton alongside talented artists Cassette Lord, Mazcan and I Own This. We’ve got some work on display already in the foyer exhibition space. We’re having a big launch party on Fri 3 May with DJs and cocktails; tickets are on sale via My Brighton. Cassette Lord and I will be working together again with the launch party of our exhibition Retro Spex Super Deluxe at Hotel Pelirocco on Thurs 18 April. We’ll be back at the Warren for the Fringe. Some of my illustration and animation has a cameo in the short film Little by Kris Williams. Little will be showing at the Cine Kink Film Fest New York and hopefully at the Brighton Rocks Film Festival. You can also see my work in Dynamite Gallery, Conclave Gallery and The Dorset. What products would you put your work on in the future? I’m actually concentrating more on my illustration portfolio. I want more work as a freelance illustrator. I’d love to see my work getting published more. More magazine covers, music-related work, gig posters, digital art for websites, editorial work. I’d love to work in the games industry. I’m seeking an illustration agent to assist with that. Does having your work on a beer can enhance the flavour? Hell yeah! I’m not sure of the correct science but beautiful packaging always makes things taste better. Fact! What’s your opinion on the Brighton art scene? Brighton is a very encouraging place for artists to evolve but sometimes there can seem to be a lot of exposure for street art and the May events such as Open Houses and a lot of great art gaining little or no focus. I think there’s probably some great stuff we never get to see. Make art. Artists rarely improve if they don’t keep producing new work. Sometimes the hardest part is making that first mark on a blank piece of paper. Amazing things can grow from that initial mark. Get your work seen. Connect with other artists.